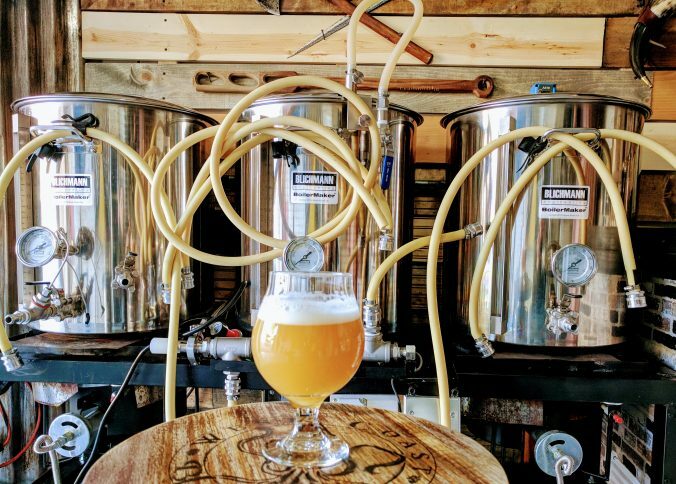 I just finished up my latest batch of NEIPA, North East IPA, Vermont Style IPA, New England Style IPA, Juicy IPA or Hazy IPA; however you chose to label it and it turned out incredible so I wanted to share the recipe in case anyone else out there was interested in brewing one. The basis for this recipe is MoreBeer’s Haze Craze IPA which can be purchased in either an Hazy IPA Extract Beer Recipe Kit or Hazy IPA All Grain Beer Recipe Kit. I just made a couple of small tweaks to mine. Although the West Coast was slow to latch on to the NEIPA trend, we have sunk our teeth in and they are currently all the rage. The haze of the yeast, hops and yeast esters pushes the boundaries of what an IPA is and can be. In order to fully enjoy them you need to discard your expectations of what an IPA is and embrace the haziness and sometimes juicy and tropical flavors that are created by new varieties of hops and unconventional yeast strains. Once fermentation has completed or on day 10, cold crash and transfer to keg or bottle.